Last week, we whined about nuisance phone calls and recommended that everybody let all unidentified calls go unanswered … with an opportunity to go to voicemail, of course. No voicemail … not important or urgent … and probably a robot. I forgot to mention that there’s an internet variant of the pesky robocalls…. Everybody gets more email solicitations than they want, right? So, how to stop them? Easy answer: click the Federally required “unsubscribe” link. 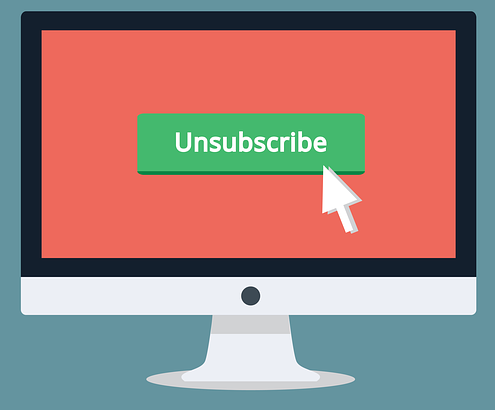 First, clicking “unsubscribe” is akin to clicking an “I’m a live person with an authentic email address”. Such a designation makes you prime meat for email solicitors. A shady operator might sell your “verified” name and email address to other solicitors. You may stop one emailer, but open the dam to others. Worst case … the link could be a hot button for a malware download. That’s a lot worse than a flood of email. Even if the odds of a click-through problem are low, they’re statistically greater than zero … which means someday it’s bound to happen. Safest bet is to set up a filter to divert emails from the undesired sender to a spam folder. You won’t be see the email (unless you want to), storage is cheap, and you can always do a bulk delete to empty the spam folder. This entry was posted on June 11, 2018 at 6:59 am and is filed under Hacked - Hackers, Hacking - Hackers, Internet security. You can follow any responses to this entry through the RSS 2.0 feed. You can leave a response, or trackback from your own site.